Waiting for my flight to Munich in Toronto, a voluble American my age struck up a conversation. Ed is an attorney from Atlanta with 7 kids -- 3 from his first marriage, 2 from his second wife's first marriage, and 2 from their marriage. "A typical American family these days," he said, meaning the mixed marriage rather than the number of kids. He launched unbidden into a scathing critique of the US, saying it was basically a basket case, becoming a totalitarian monster, and that he was looking for a place to move to with his family. When I told him I was going to Cairo, he asked if Egypt was a good prospect. Considering it was in the midst of a revolution, I suggested he consider Cyprus as a better option. 2010 was a tough one overall. Public discontent with governments and economic policy brought people out on the streets to protest. US wars, occupation and threat of war in the Middle East and Asia were never far from the headlines. Elections around the world led in most cases to further tensions. There were few outright winners and many more losers, with most developments a mixed bag. Much is being made of North Korea’s shelling of one of 30 disputed islands, Yeonpyeong, which houses a South Korean military base, well inside what should be a demilitarised zone between the two Koreas resulting in the deaths of two South Korean marines and two civilians. The borders were unilaterally drawn by the UN at the end of the 1950-53 war and the countries are still officially in a state of war. Rumours are that the incident is connected to the possible transition of power from North Korean leader Kim Jong Il to his son Kim Jong Un, or to North Korea’s recent announcement that it is proceeding with its nuclear programme. The skirmish began Tuesday when North Korea warned the South to halt military drills at the base, after which Seoul began firing artillery directly into disputed waters within sight of the North Korean shore. The North retaliated by shelling the Yeonpyeong military installations. Seoul responded by unleashing its own barrage of howitzers and scrambling fighter jets over the North, killing far more North Koreans though the actual number is not yet know. The words of condemnation -- of the North -- from UN Secretary-General Ban Ki-moon and US President Barack Obama for the “provocation” flowed, as expected. Obama used the occasion to reaffirmed plans to stage joint military exercises later this week in the Yellow Sea, the latest in its own provocations of both North Korea and China this year, following the sinking of a South Korean warship in an earlier joint US-South Korean military “exercise”. Accusations that North Korea torpedoed the Cheonan, killing 46 sailors, were undermined by evidence pointing to the US itself. Pyongyang denied responsibility. 400 of the 1,700 residents of Yeonpyeong were evacuated. 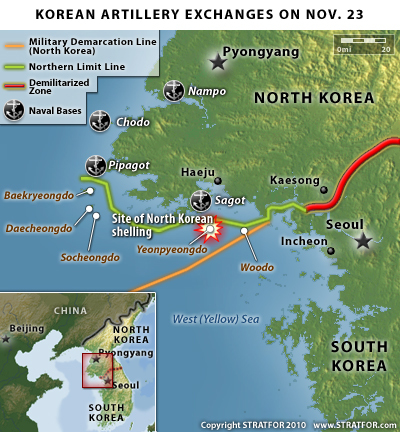 Instead of demilitarising the disputed islands and agreeing to mediation, the South Korean government announced it would strengthen its military forces there and halt aid to the North, while the North warned of more military strikes if the South encroaches on the maritime border by "even 0.001 millimetre." That the provocation is from the South Korea side, with its pro-US President Lee Myung-bak, who has made his anti-communist sentiments clear in the past, is confirmed by the fact that the incident failed to scare off investors, with South Korea's stock market experiencing only a momentary ripple. Nobel Peace Prize (1934-2012+): Which human rights? [Updated 2014] Awards have become less and less controversial, especially since the US imperial ascendancy in 1991. With the rise of Hitler, the Peace Prize committee finally mustered up the courage to take on Nazism, and awarded the 1935 prize to Carl von Ossietzky, a German journalist and pacifist who had spent several years in Papenburg-Esterwegen, a Nazi concentration camp, convicted of high treason and espionage in 1931 after publishing details of Germany's violation of the Treaty of Versailles by rebuilding an air force and training pilots in the Soviet Union. (Ironically, the verdict was upheld by the Federal Court of Justice in 1992.) At the time it was a highly controversial decision (though not with anti-fascists), with two jury members resigning, fearing a political fallout with the Nazis. Everyone knows that Alfred Nobel created his eponymous Peace Prize partly to assuage his guilt for unleashing dynamite on an already saber-rattling world. Fewer know that he wrote at the time that if the world still needed the prize 30 years later, we would "inevitably lapse into barbarism".